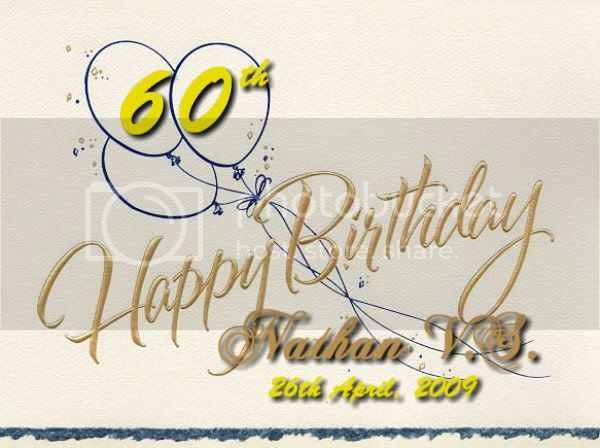 PSM Forum Welcomes you • View topic - 60th Birthday (26 April, 2009) - Nathan V.S. 60th Birthday (26 April, 2009) - Nathan V.S. Wishing You A Very Fun-Filled 60th Birthday! May You Have Many More for Us to Wish You! Re: 60th Birthday (26 April, 2009) - Nathan V.S. Who is Nathan V S ? President ? Anyway, a happy birthday to you too. Many happy returns of the day - and you kept quiet about it at yesterday's meeting. Anyway wishing you many many more birthdays. Last edited by sidtoh on 27 Apr 2009 10:28, edited 1 time in total. V S nathan and V T nathan are different identities. Maximaphily - A new wave in Philately . Maximum cards of today, collectibles of tommorrow. Happy belated Birthday! No wonder you were early for the exco meeting and mentioned about the need to know the birth dates of all PSM members ! alexquek wrote: Happy belated Birthday! No wonder you were early for the exco meeting and mentioned about the need to know the birth dates of all PSM members ! Hi Alex , as mentioned earlier, V S is NOT V T .. do you see the difference ? We will remember your 61st birthday better.